All visits are booked by the prisoners at the prisoner information centre. The coffee shop is situated in the car park of the prison and opens at 7.30am. Lockers are available in the coffee shop for those who travel by public transport. After booking in, visitors will walk up to the main gate. Once inside the visiting room there will be a Tea Bar (run by Nepacs volunteers) where you can purchase snacks and drinks for yourself and the person you are visiting. Car parking is available in the visitors’ car park by the coffee shop. Disabled parking is available outside the main gate but this needs to be arranged with the prison in advance of the visit. If you are travelling by public transport, the prison is a 10-minute walk from Yarm or a short taxi ride. There is a play area within the visiting room which has a selection of toys. There is also a small play area with limited seating immediately outside the visiting room. It is visitors' and prisoners' responsibility to supervise their children. Special family visits take place during all half term holidays and one father child visit per year, which takes place in the summer holidays. Family learning visits take place weekly during term time. Ask the family support team for more information or pick up a leaflet in the visit’s hall on your next visit. Children will need ID if the prisoner has child safeguarding restrictions, then the child will need photographic ID such as a passport. 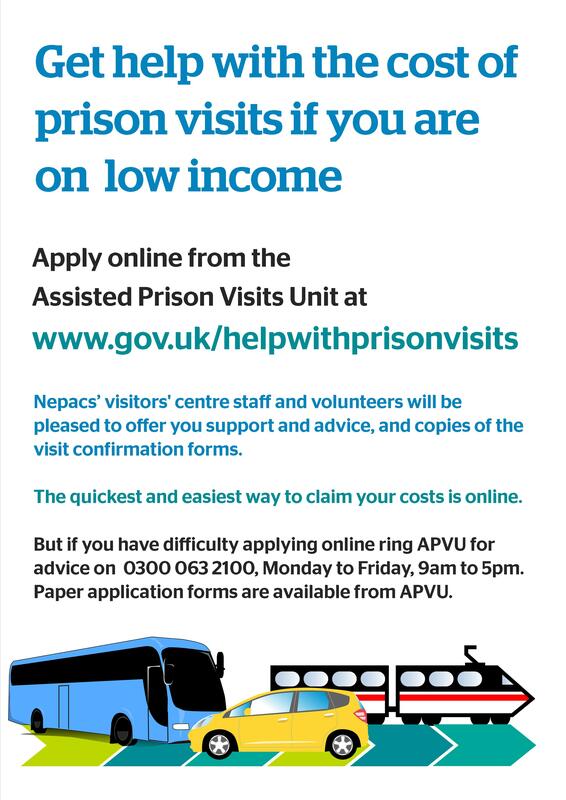 Prisoners are entitled to one visit per week but they cannot be accumulated. Enhanced prisoners get an additional visit per month. Visits take place from 1.45pm to 3.45pm every Wednesday and Friday, and on weekends visits are available from 9am to 11am and 1.45pm to 3.45pm, Saturday and Sunday. Visitors must arrive at least 30 minutes before the end of visiting times. If you are late the latest you will be allowed in is 30 minutes before the end of visits. The prison reserves the right to refuse entry and will not tolerate verbal abuse or anyone under the influence of drugs or alcohol. Visitors must be dressed appropriately - the wearing of shorts, vests or hats is prohibited. Please note, if a visitor has been banned from another prison they will not be allowed entry. How many people are allowed on each visit? Only 3 adults with up to 3 accompanying children may visit (additional children who are blood relatives - son/daughter - may visit if space is available in the visits hall). All visitors' full names must be submitted. £20.00 (in change or £5 or £10 notes) per adult to spend at the Tea Bar. Mobile phones are not allowed in the prison. There will be no smoking in the prison. Everything else is to be left in your locker. As a category D/resettlement prison HMP Kirklevington Grange is more relaxed and family friendly than other prisons. Visitors to HMP Kirklevington Grange are subject to random checks and searching, which is similar to a domestic airport. Passive drug dogs are sometimes deployed at Kirklevington Grange - if your child is frightened of dogs you should inform staff. The dogs are friendly and do not bark or jump up. Can I take anything for the person I am visiting? The prisoners needs to go through the application process and each one is treated on an individual basis. What items can I send to the prisoner? Only essential items will be allowed on a visit. These will be assessed and authorised in advance. It is currently unclear at this point in time if there is a minimum or maximum that can be sent via the system. It is also suggested that you contact the prison to check if they are still accepting money via postal orders, cheques and money. The prisoner is able to telephone his family/friends any time of the day and has access to a number of telephones within the prison. The prisoner will need to pay for phone credit in order to use the telephones, which goes on their account each Wednesday, and your telephone number needs to be cleared with security. It may take a few days for a new telephone number to be approved. Be aware that it is expensive for a prisoner to ring a mobile phone (even if it goes through to voicemail). They are also able to write cards or letters (see 'How can I write to or contact the prisoner?' above). If you have concerns about a prisoner you can always leave a confidential message with the prison by telephoning 01642 792600. You can also complete a query slip located on the Nepacs noticeboard. Who can I contact if my family needs support? If you or your family have any additional needs, medical or otherwise, please contact the family support worker team, on 01642 792721. A family support volunteer will be in the visits hall on a Wednesday and Friday if families require information, advice or guidance. Please speak to the Tea Bar staff and pick up a referral form displayed at the Tea Bar. How can the family support work team help? You may be able to claim travel expenses if you are on a low income or in receipt of certain benefits. For more information about visiting please get in touch with the family support worker on 01642 792721.